Our daughter Lynn graduated with her Ph.D. at University of California, Irvine this weekend. We stayed at the Montage in nearby Laguana Beach. The grounds and views from the hotel are stunning. The hotel also hires a falconeer to keep the seagulls and pigeons away. We didn't bring our birding gear, but got some nice photos of the birds of prey with our "people" camera. 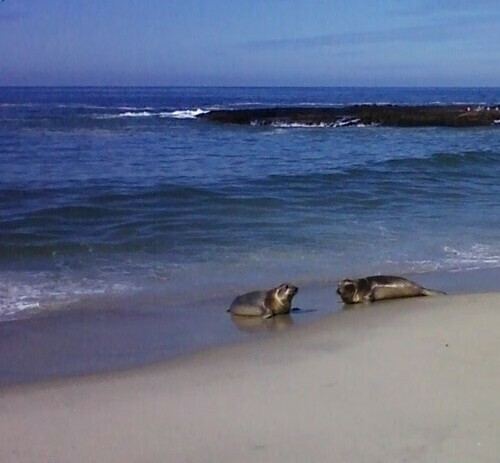 On our last day, we were thrilled to see two rehabilitated elephant seals being released. I'm sorry that this is unrelated to the topic of the post, but I couldn't find an email address and have a question you might be able to help me answer. I occasionally see a particular type bird around marshy areas near the coasts of north and south Jersey. It looks a lot like a snowy egret, except its feathers are a very dark gray (nearly black) all over its body. I can't find any matches on allaboutbirds.org and was hoping you might be able to help identify it. I'm stumped.